Posted by cafuego on Monday 2 January 2017. During public viewings at Mount Burnett Observatory, people often want to see a galaxy and ask to see Andromeda. However, we always need to disappoint them, as at our latitude of 37.5 degrees south Andromeda barely rises high enough to clear the trees. And even if it does clear the trees, it's so low in the sky that you're looking at it through light pollution and dusty atmosphere. So I thought I'd make a montage of the Moon and our visible galaxies (the Magallanic Clouds) to show of their relative sizes. Hopefully that will make people eventually ask to see these, as they are easily bright enough to see from a dark spot with the naked eye when the moon isn't up! I took the Moon from the original photo by Stephen Rahn and pasted it onto (approximately) the south celestial pole on a long exposure photo I took of the southern sky over the 2016/2017 New Years weekend. 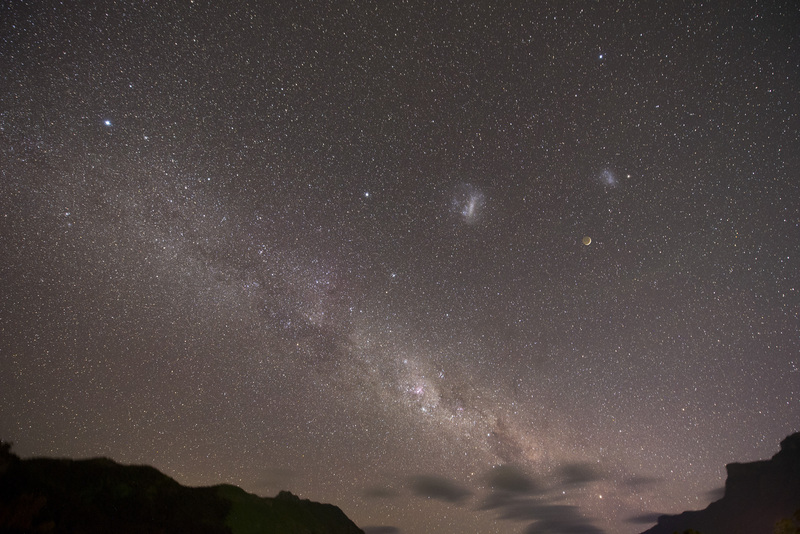 The visible part Large Magellanic Cloud in this photo is about 2.5 degrees on the short axis, so that makes it about 5 times wider than the full moon, which is about half a degree. If anything, I estimated the moon to be a little bit too big in this montage. There are also fainter parts that I couldn't capture in this photo. On the long axis the full LMC is about 10.5 degrees across - 21 times the width of the Moon! So, the next time you see the original montage with Andromeda do the rounds and wish you could see a large galaxy, all you need to do is go outside on a dark night and look up! You can find my original southern sky image on Flickr.